Suitable for all life stages and made in the USA! Beef*, Beef Lung, Beef Liver, Beef Heart, Parsley, Pumpkin, Rosemary, Inulin (from Chicory), Ground Beef Bone, Vegetable Glycerin, Taurine, Choline Chloride, Mixed Tocopherols (Vitamin E Supplement), Zinc Proteinate, Zinc Sulfate, Iron Sulfate, Vitamin E, Iron Proteinate, Selenium Yeast, Copper Sulfate, Nicotinic Acid, Calcium Pantothenate, Copper Proteinate, Manganese Proteinate, Vitamin A Supplement, Vitamin K1, Vitamin B12 Supplement, Manganous Oxide, Vitamin D3 Supplement, Ethylenediamine Dihydriodide (Source of Iodine), Riboflavin Supplement (Vitamin B2), Thiamine Mononitrate (Vitamin B1), Pyridoxine Hydrochloride (Vitamin B6), Folic Acid. Pregnant/Nursing: Feed double the amount indicated. • Keep Fresh, clean water available at all times. • Can be fed as is for most pets or mixed with water for pets that need extra hydration due to health issues or lack of drinking water. • Take caution not to overfeed, each oz of Real Meat Food is equivalent to 3 ozs of fresh meat! • For pets with gas issues try adding 1 teaspoon plain yogurt to the meal. When transitioning from grain-based dry foods to Real Meat High Meat Diets, introduce slowly over 5 days. Can be mixed with dry food or rice/potato if all meat diet is to rich for animals with sensitive systems. When mixing with other foods reduce the amount of Real Meat Food accordingly to avoid overfeeding. I have 3 cats and finding something that they all like and can tolerate is near impossible, but this food fits the bill. This along with Stellas is what I feed if I will be away during their meal time. I put it in a box with a timer and it opens at the appropriate time. Always completely empty when I come home:) I also use it as a topper and a treat; they love it!! I struggle to get my rescue cat to eat anything that's good for him. If he had his way he'd eat the corn based garbage from the grocery store. His taste in canned food isn't much better. This he'll at least pick at in between his canned breakfast and dinner. When I first gave the product to my cat it ate some of it but then did not eat any other time I tried giving it to him. My guess it may be the rosemary you add to it. Loved the ingredients and after reading the reviews I took the risk of buying it even after seeing other people’s cats wouldn’t touch it. I have one cat who will eat anything and two picky cats, all three love this food. And I feel good about feeding it! I ordered this as an in between canned food feedings for my three cats. My male has IBD so he is limited to beef on the choice for proteins. My two males devour this stuff, my female won’t touch it because she is missing teeth (age 19) and I think she has trouble chewing it. It smells appealing not repulsive like another brand I tried. I am definitely reordering this one. This is the worse product i have ever purchased in my 50 years of owning cats and dogs. Both my cats love this and I know they are getting something good for them. Even my fussy cat eats this. Great quality, but cat says no. 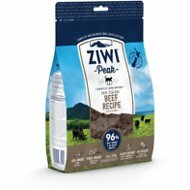 This is is a pure and simple product, great protein for any of you carnivore or omnivore pets. Friends dogs loved it, but my cat wouldn't touch it. I ground it into a powder as a food additive, chopped, diced, sliced... He rejected it in any form regardless if hidden in his food. The best cat food ever! The Real Meat brand is great for my cat as its close to what he would eat in the wild. I notice his eyes are brighter and his coat has a glossy sheen to it. He seems really happy. I don't give him cans anymore! I take it many people were less successful with this, in terms of acceptance. So maybe this is one of those "You just have to try it" kinds of foods, because my guy dove in like this was manna from heaven. It is currently his favorite food. And that makes Mom happy since this is a raw food, with few or no weird additives, which is more reasonably priced than comparable brands. The only downside is that there appear to be only two flavors, and since Allergy Boy here can't have lamb, that leaves us with only one. Bummer!